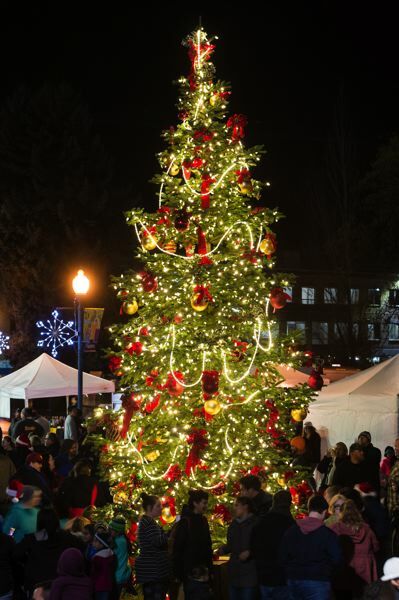 Forest Grove's tree-lighting ceremony is next Friday, Nov. 23. Other local events follow into early December. Forest Grove doesn't waste any time in kicking off the holiday season. The day after Thanksgiving, the city will hold its annual tree lighting. At 6 p.m. Friday, Nov. 23, the public is invited to gather at the Forest Grove Senior & Community Center to watch the lighting of the holiday tree. This year's tree-lighting in Forest Grove is in a new location. Previously held by the 7-Eleven at the east end of town, the popular ceremony shifts closer to downtown with its new site, located at 1237 Douglas St.
"We have a new tree at the senior center, on the west side of the building," said Howard Sullivan, executive director of the Forest Grove/Cornelius Chamber of Commerce. Sullivan is excited about this year's event. Santa and Mrs. Claus will be in attendance, of course, and refreshments will be served inside the senior center once the tree is lit. There will also be a performance by the Neil Armstrong Middle School choir. "We'll have all kinds of stuff going on," Sullivan promised. Next up in the procession of holiday tree-lighting ceremonies in our area is the Aloha community. Rhonda Inglis Kittredge organizes an annual tree-lighting outside the Bales Market Place. In the Bales parking lot, located at 17675 S.W. Farmington Road, the Aloha Christmas tree will be lit up at 6 p.m. Saturday, Nov. 24. The event is free to attend, and children are welcome. Refreshments will be available, and there will be vendors, raffles and kids' activities — including photos with Santa Claus. The following day, also at Bales, there will be a bottle and can drive from 10 a.m. to 2 p.m. Sunday, Nov. 25. All proceeds go to support the Beaverton School District's high school snowboard team. Saturday's event will mark the eighth annual Christmas tree-lighting in Aloha. The community tradition was started in 2011. As is tradition at Greenville City Park in Banks, on the Sunday following Thanksgiving, people young and old are invited to attend the lighting of the Banks Christmas tree. At 6:15 p.m. Sunday, Nov. 25, the festivities will kick off with musical performances by choirs and bands from Banks Middle School and Banks High School. At 7 p.m., Mayor Pete Edison will lead a countdown to the lighting of the Christmas tree. Refreshments will be provided by the Friends of the Banks Public Library. Santa Claus will be making an appearance courtesy of the Banks Fire District, which is providing a fire engine to transport the jolly old elf to the park at 41905 N.W. Arbor Park Loop. He is scheduled to arrive at about 6:30 p.m. This is the seventh annual Christmas tree-lighting in Banks. Also holding its seventh annual tree-lighting is Cornelius. The holiday tree will dazzle beginning at about 6 p.m. Friday, Nov. 30, at Veterans Memorial Park. The tree-lighting ceremony will begin following the arrival of Santa and Mrs. Claus in a Cornelius Fire Department truck. At about 6:20 p.m., Mayor Jef Dalin will join Santa to light up the tree at the park, on the south side of Baseline Street in between 12th and 13th streets. Event-goers will enjoy holiday songs performed by students from Cornelius Elementary School, Neil Armstrong Middle School and Forest Grove High School, including both English- and Spanish-language music. There will also be candy canes for children. After the lighting of the tree, the festivities move up to Cornelius Elementary School, located at 200 N. 14th Ave. just about two blocks away. Refreshments will be served in the school cafeteria. All are invited to the Gaston Rural Fire District station on Friday, Nov. 30, from 7 to 9 p.m. The fire station at 102 E. Main St. in Gaston is hosting its annual tree-lighting and light show. Santa Claus will be paying the station a visit for the evening as well. Of course, Gaston has a proud tradition when it comes to holiday trees. A Douglas fir grown near Gaston was donated by Stimson Lumber Co. to serve as the famed holiday tree at Pioneer Courthouse Square in downtown Portland — the 17th season in which Stimson has provided the tree. The 70-foot fir tree arrived in Portland on Friday, Nov. 9, and it will be lit up at a ceremony on Friday, Nov. 23. Holly Days are here again! The beloved holiday celebration returns to downtown Hillsboro from 2 to 6 p.m. Saturday, Dec. 1. Hillsboro Holly Days features more than 40 booths, along with all-ages activities and delightful performances. The center of festivities is Tom Hughes Civic Center Plaza at 150 E. Main St. 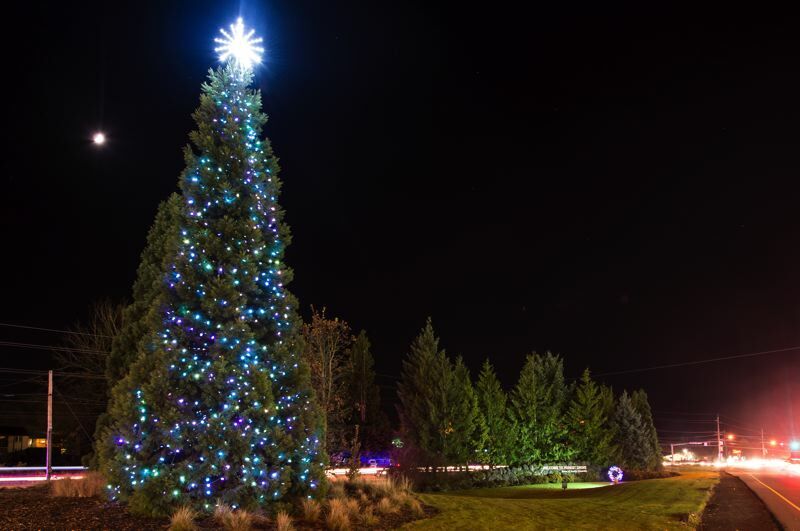 The main event is at 5:30 p.m., when Mayor Steve Callaway and a "surprise guest" (who may or may not be the fun-loving Santa Claus) will light up Hillsboro's holiday tree. The festival is traditionally held on the first Saturday of December, which this year falls on the first day of the month. It is presented by the Hillsboro Downtown Partnership in conjunction with the City of Hillsboro and the Hillsboro Tuesday Night Market. Anyone who knows the Orenco neighborhood of Hillsboro knows that it's a little different. So, of course, the neighborhood has its own separate holiday festivals — two of them, in fact. From 6 to 8 p.m. Friday, Nov. 30, members of the community are invited to Jerry Willey Plaza at Orenco Station for a Christmas tree-lighting. Along with the traditional lighting of the tree, there will be live music, food, kids' activities, contests and more. Undeterred by the physical constraints of also having appearances in Cornelius and Gaston Friday night, Santa Claus will be visiting Orenco for this event, too. The tree-lighting is put on by Evergreen Christian Center. Two days later, another holiday event will fill Jerry Willey Plaza with cheer. The Chabad Jewish Center of Hillsboro is putting on a Hanukkah celebration, starting at 4:15 p.m. Sunday, Dec. 2. There will be a fire juggler, latkes and doughnuts, kids' activities, live music and more. The main spectacle, of course, will be the lighting of the "grand menorah." There is no charge to attend Sunday's event. However, attendees are encouraged to RSVP on the Facebook event page. Jerry Willey Plaza is located at 943 N.E. Orenco Station Loop. The 14th annual Jingle Thru North Plains holiday parade will be held Thursday, Dec. 6. Starting at 6 p.m., parade participants — including cars, trucks, trailers, motorcycles, bicycles and golf carts — will line up at Jessie Mays Community Park, located at 30975 N.W. Hillcrest St. 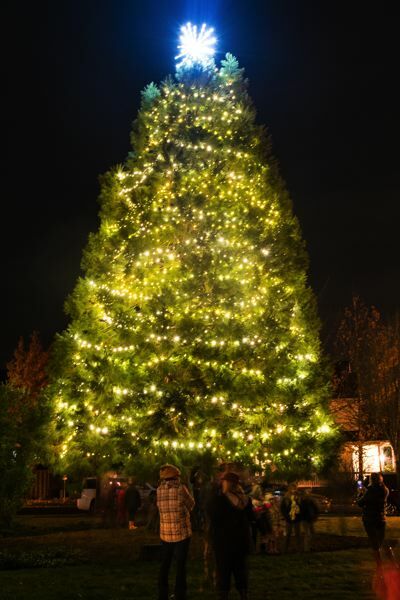 The real fun begins with the lighting of a holiday tree at the park at 6:15 p.m. Following that, Mayor Teri Lenahan will lead the parade out at 6:30 p.m. The parade will, indeed, jingle its way through North Plains for about 45 minutes before returning to Jessie Mays. There will be caroling, refreshments and visits with Santa Claus in the Jessie Mays Community Center. Awards will be given for the best decorated vehicle, as well as the best decorated homes and businesses. For the latter categories, entrants are asked to put up their lights by 6 p.m. Sunday, Dec. 2. Jingle Thru North Plains is sponsored by the North Plains Public Library, the North Plains Events Association and Loch Lolly Christmas Forest. South of Gaston, Yamhill will have its own Christmas tree lighting ceremony on Friday, Dec. 7. The ceremony will begin at 6 p.m. at Yamhill City Hall, located at 205 S. Maple St. Refreshments will be served immediately after the ceremony. Santa Claus will make an appearance as well. Mayor Paula Terp will lead a reading of the holiday classic "'Twas the Night Before Christmas" at the event, which will mark Yamhill's 10th annual tree-lighting. This is Terp's final Christmas season as mayor. She did not run for re-election this year. Current City Councilor Yvette Potter will succeed her in 2019, having been elected to serve as a two-year term as mayor on Tuesday, Nov. 6.